From time immemorial, the lotus flower has been a symbol of the very best things in life: refinement, purity and beauty. In Indian art the flower has always represented heavenly comfort and spiritual enlightenment. Now, as a balm for our unquiet times, a new level of meaning has been added to these traditional ones. As stewards of the local land, we do all we can to create an eco-friendly environment. The Lotus operates a strict no-smoking policy, and mindful of any potential pollution in Kerala and we also have an eco-friendly ‘no-plastic’ rule. Safe and pure drinking water is supplied from the latest ‘reverse-osmosis’ purification system, rather than from indestructible plastic bottles. No waste is discharged into the lake. 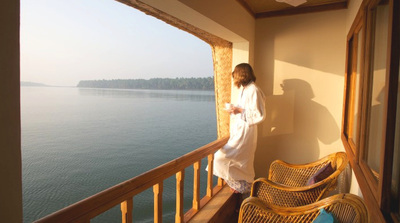 The Lotus is an imaginative new interpretation of the traditional Kerala houseboat, a unique creation that combines the natural rhythms of the old-fashioned with the modern amenities of a first-class hotel. 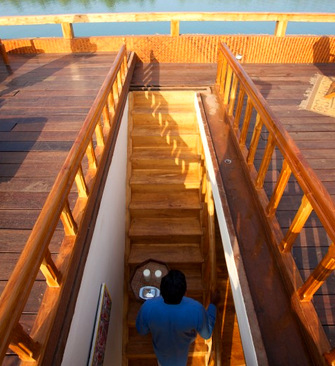 Each of the two bedrooms (appropriately named Sukhima (‘Happiness’) and Lalima (‘Beauty’) measure over 16 x 13 feet and have solid teak floors. Light and airy with cheerful colours, they have a large glass observation window with insect-proof screen, locally made wooden furniture, ethnic durrie rugs and paintings by a Kerala artist in the traditional temple mural style, as well as an i-Pod docking system, safe and hair-dryer. Guests have the option of a fan or state of the art air-conditioning. 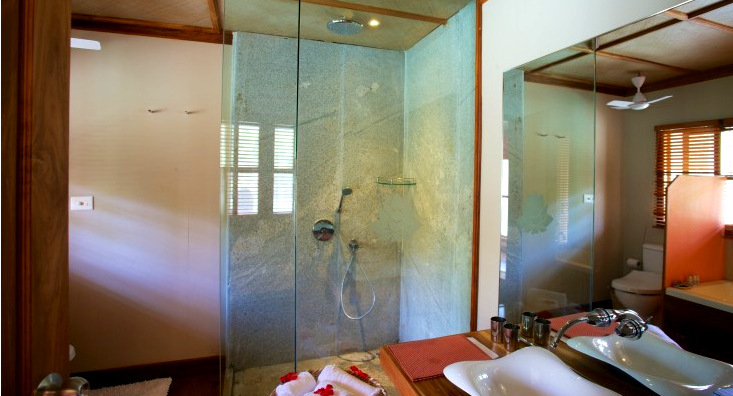 Each bedroom has an en-suite bathroom with tub & shower and delicious organic Fabindia toiletries. Each bedroom also has its own private sitting-out verandah to enjoy those special moments. There are two public areas for relaxing and enjoying a drink or a meal - the lower Sitting Room and the upper Sun-deck.  Ayurveda Massage and Yoga lessons are available on request (extra charges apply).  Silent engine, air-conditioning and fans. We highly recommend a minimum of 2 nights cruise to enjoy the tranquillity and sights that unfold while cruising. From 15th Dec to 15th Jan, there will be a supplement of Rs. 2000 on the above rates. From 1st Feb to 28th Feb, there will be a supplement of Rs. 1000 on above rates.  Morning Lotus special bed tea with flowers.  Breakfast as per choice, lunch, afternoon tea and sumptuous evening meal.  Complimentary fresh fruits throughout the day are available. 1-Rates are valid for both Indian and Foreign nationals. 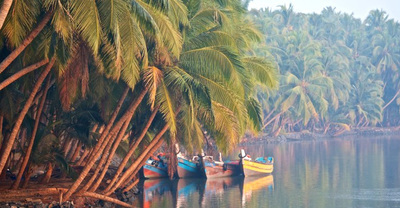 2-Rates are in Indian Rupees and inclusive of all taxes. 3-Only One Extra bed in each room will be available. 5-All payments to be made 45 days in advance. 6-Check-in 12 noon/ Check-out: 10 am.